The Maryland Cybersecurity Center (MC2) and the Division of Information Technology joined forces for Maryland Day, Saturday April 27, 2013, to teach visiting families about the importance of powerful passwords and Internet safety through interactive activities. With growing Internet access, children often learn to use a smartphone before they learn to tie their shoes. Now, it is more important than ever to make sure that families are safe online and are using strong passwords. Kids and adults alike were excited to meet Faux Paw, the web-surfing cat mascot for Internet safety of the Internet Keep Safe Coalition. With the help of IT security specialists from the MC2 and the Division of IT, Faux Paw explained to visitors how to be safe online, protect personal information, and develop good IT security habits. 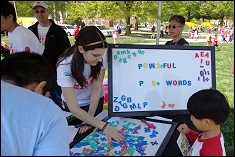 Through a hands-on, kid-friendly activity, families were taught password dos and don’ts and learned how to apply the elements of length, complexity, variation, and variety in designing a powerful password. With the best approaches in mind and colorful magnetic letters, numbers, and symbols in hand, families worked together to design passwords that will keep their online transactions secure. Participants took away a fun beach ball as a reminder of Internet safety as well as a plan for their next password change.